The post below is more personal than a typical post, but it seems appropriate on a day like today. I apologize in advance for its length. Some days mark our lives more than others. Ten years ago today, July 29, 2005, was one of the most terribly memorable days of my life. My dad died suddenly while playing basketball. I and other family members were in the room and saw it happen. He was literally there one moment and gone the next. There have been many moments in the past 3652 days that I’ve had occasion to question God’s wisdom in taking my dad when He did. At the same time, there have been many times when I’ve been moved to prayer, worship, and faith in God’s sovereignty as I’ve reflected on all that God has done (in spite of still not knowing the answers to all of my questions). There are times when that crystal-clear moment seems like it was yesterday, and there are other days when that instant feels like it was 100 years ago. Grief is a weird cycle of intense/dull/intense/dull/etc. Thankfully the immediately intense grief of that day has lessened, but that’s a pain in and of itself, as it reminds me that he’s been gone long enough for the pain to lessen somewhat—or at least morph into a different kind of pain. Sometimes the cycle is related to important dates (e.g., Father’s Day, birthday, holidays, etc.). But it’s often completely random—driving alone in the car when a memory comes to mind unbidden and unexpected. Life has been marked with further losses since the passing of my dad, and we’ve grieved with others who have lost loved ones. Sadly, this world will leave all of us carrying burdens of grief and loss. The burdens look different for each person, but they’re real for us all. It’s times like these that teach the children of God what it means for God to be our Shepherd (Psalm 23), our Father (Psalm 103), and our Peace (Ephesians 2). Even those who experience the same loss feel that loss differently. My mom lost a faithful husband of three decades. My youngest siblings lost a dad for their childhood and formative years. My middle siblings lost a father-figure guide for their terribly difficult adolescent and young adult years. And we older siblings lost a rock, guide, mentor, friend. We all miss him, but we all miss him through the grid of our relationship. Recognizing this allows us to empathize with each other yet also recognize that there are parts of the grief of others that we can never fully understand. The only one who can fully understand is Jesus the Priest who experienced life as we experienced it, who endured much greater grief than we’ll ever experience as he bore the wrath of God in our place. And I thank God for that; I thank God that Jesus is a friend for sinners. 1. I’m thankful that my dad had a unique combination of high expectations and full acceptance. There was probably no one in the world harder on me than my dad, yet I also felt fully loved and accepted by him. I’m thankful for the way he pushed me in my work, in my play, and in my walk with Christ. I’m also thankful that I don’t ever remember feeling like failing would change his love for me one bit. My dad knew the worst things about me and still fully accepted me. In this way, he beautifully modeled the love of God for me. 2. I’m thankful that my dad consistently worked to make time for each of his nine kids. Our house was. full. of. kids. We loved it, and I still love it. At the same time, being a father myself now, I recognize the sacrifice of time and love it took for him to get down on the floor and play “Candyland” with my youngest sister, then get up and hear the relational heartaches of his older children. 3. I’m thankful for the example of my dad and mom in their faithful perseverance in marriage. A friend once told me, “Marriage is the best and the hardest thing that’s ever happened to me.” And he’s right. It’s awesome, and it’s hard. I’m thankful for my dad’s example of leadership and my mom’s example of commitment that led them to persevere in a loving relationship in good times and bad. I never thought their relationship was perfect (I lived with them, after all—like my kids do with me), but it was awesome to experience a double date with my parents the night before my dad died and see their fresh love in the 30th year of their marriage. 4. I’m thankful for my dad’s work ethic. I’ve never known anyone who worked harder than my dad. “Work hard; play hard,” he said. And we did. I’m thankful that he passed that legacy to his kids and urged us to fight through and repent of childish laziness. 5. I’m thankful for my dad’s foresight. My dad worked at a church my entire life and managed a household of nine children. Yet he planned ahead for provision for his family, in case he were ever absent. He didn’t expect to be gone, but he had prepared for that day. When I was twelve or thirteen, my dad had me sit down and write out how many hours I’d need to work at a given wage to pay my way through college. He expected all of us to pay our way, but he helped prepare us for that reality. I graduated college with a car, a computer, and some cash in the bank—thanks to my dad. 6. I’m thankful that my dad loved people. It was shocking to see some 3000 people show up to my dad’s visitation and to hear story after story of people he had blessed or encouraged. I had no idea. He was just my dad. Yet he somehow made time for us and also managed to touch the lives of thousands of other people. It was an overwhelming moment and is still a legacy I treasure. 7. I’m thankful that my dad loved telling people about Jesus. He was a faithful, persistent witness who spoke the gospel and lived the gospel. He shared the gospel with two non-Christian men the day he died. His lifestyle of evangelism is convicting and motivating. 8. I’m thankful that my dad loved his local church. My dad was a businessman with a pastor’s heart. He spent his life serving the church vocationally as a financial administrator, and he made sure his family loved and served the church too. If the doors were open, we were there. And we loved it. He helped me process the flaws of church and of people without turning my back on the church and the people in it. That’s a legacy that is a huge gift to me, a deeply flawed pastor of a congregation of flawed people. 9. I’m thankful that my dad (and mostly my mom, I’ll admit…) gave me eight siblings/friends. It was awesome growing up, and it’s awesome having a family/team of people that love each other, are pulling the same direction, and think about life roughly through the same grid. I loved working with them and playing with them growing up, and I love talking to them and hearing about their lives now. 10. I’m thankful that my dad was a man of conviction and courage. I saw my dad take courageous stands in great and small ways. Sometimes it was the courage of relationship—being willing to say a difficult thing—and other times it was courage of integrity. I will never forget the eighteen months he spent graciously pointing out the proud and selfish way I was treating others as I proudly and selfishly ignored him … until one day God’s Spirit opened my eyes and moved me to tearful repentance through my dad’s courageous persistence. 11. I’m thankful I had 24 years with my dad and that I get to see him again. Some have much less. I’m so thankful. And I’m grateful that my dad knew Jesus and led me to know Him too. It was my dad that led me to Jesus 30 years ago, and because of that we’ll get to sing “Jesus, Thank You” together one day. Daddy, I (we) miss you, love you, and can’t wait to see you again. And at least a thousand times I’ve rejoiced for you. Is how long must I wait to be with you? Help me, Lord, cause I don’t understand your ways. The reason why, I wonder if I’ll ever know. Cause I’m still here so far away from home. And in Christ, there is no end! And I close my eyes, and I see your face. If home’s where my heart is, then I’m out of place. Lord, won’t you give me strength to make it through somehow? I’ve never been more homesick than now. Thankful for you and Liz, Josh, and for sharing your heart. Thankful for your reminders to hold my dad a little closer. But to see even more your faith and steadfastness to the faithfulness of God through it all and the following years is a testament and legacy you are building. May the God of all comfort hold you even closer today, as He always does. Thanks so much for your encouraging words, Stacey–great to hear from you and hope you are well! Thank you Josh for the wonderful tribute. I miss him much also. Thanks, Uncle Marty–and thank you for the example of your faithful friendship with my dad. I’ve learned much from it and been encouraged by the way the Lord used the two of you to encourage each other! ‘Blessed are the dead which die in the Lord from henceforth. . . that they may rest from their labours; and their works do follow them” (Rev. 14:13). Your Dad touched many lives both inside and outside of your family circle, and those “works” continue. We are stronger because of his testimony and service. Thank you, Dr. Dunbar for the kind words–they mean a lot. I hope you and your family are well! Your dad was a great man and a dear friend. Thank you, Dr. Polson. And thank you for your ministry to Liz and me over these past years–it has been a great encouragement! We have enjoyed the opportunity to get to know you and Mrs. Polson more personally. There is not a person I know that had personal contact with your father that wouldn’t agree with your comments. We all miss him! Thanks, Mr. Salle, for the kind words and for taking the time to read this. I hope you and your family are well! Sadly, I never had the opportunity to meet your father, but in some ways I feel like I have because I’ve had the privilege of knowing you and to a lesser extent some of your siblings. His legacy in his children bears witness to who he was and the things you write about him are evident in you. I’m sure he would be very proud. Thanks so much for the kind words, Shannon. I would love for you to meet him. I think the two of you would’ve gotten along well. Maybe someday that will work out. Miss you, brother! We had some good talks over sushi. I know I never knew your father (I would have loved to meet him) and I pray for your grief, but rejoice with you because we share the same heavenly Father and even though our earthly father’s can’t always be there for us, He always is. He will never leave us or forsake us. I said a prayer for you this afternoon that God will fill your heart with unexplainable joy today. Thanks for the kind words, Jared! I miss our opportunities to get together and catch up on what God is doing in our lives. I hope you and your family are well. Exciting to hear how God has continued to direct your steps. I remember your Dad back when he worked on the staff at Tabernacle Baptist Church in VA Beach, VA. I was a new believer back then serving in the US Navy at Norfolk. I remember hm being a kind and giving man. 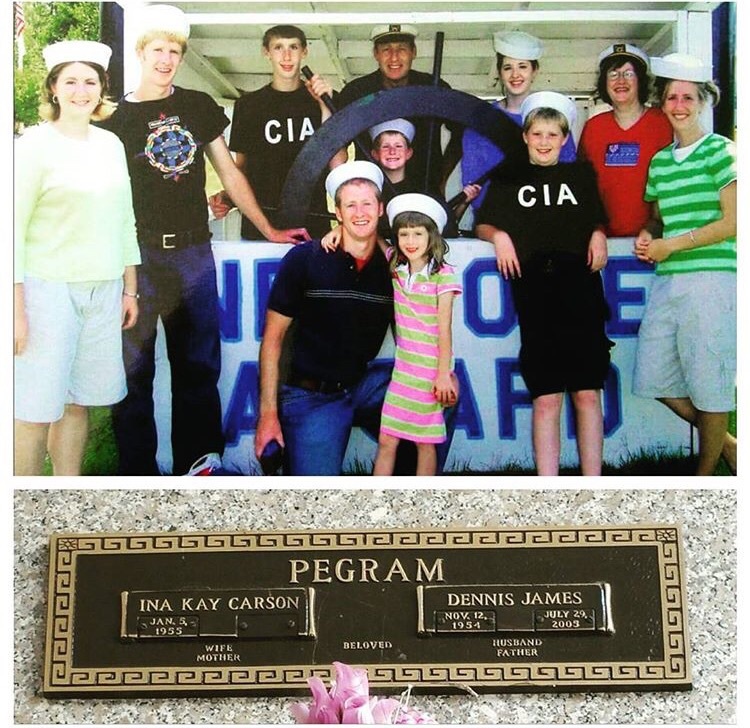 God Bless your family I am sure Dennis Pegram touched many lives! Thanks for your kind words, Mr. Dewar. It was kind of you to take a moment to share your memories with us. Joshua, your words really resonated with me. Today, July 29, was the day that my dad passed away 13 years ago. I was 19 years old at the time. He died suddenly as well…he took his own life. The raw grief of that day is something I can never forget. But how good to know that God is faithful through it all! The day my dad died, the Lord kept bringing part of a verse from Psalm 73 to mind: “Nevertheless I am continually with thee.” Somehow the Holy Spirit helped me to cling to that truth throughout the terrible events of that day. I’m glad that God left us the immeasurable treasure of His Word that is like an anchor in the storm. Life may leave our ships battered and worn, but praise God we have an anchor that keeps the soul! And one day, Jesus will guide us safely to harbor. I look forward to meeting your Father someday. Thank you for sharing how the Lord used him in your life. I pray that you continue to find comfort and hope in the Lord Jesus Christ. Wow, Ellis–thanks for sharing the story of your dad’s passing. I’m sorry for your grief and pain and prayed for you that God would give you grace, strength, and peace through Christ, that you would know the love of God that surpasses knowledge (Ephesians 3:14-21). Thank you for the encouragement and for your testimony of persevering faith in Christ. Dear Josh, My twin sister Joyce and I attended your Dads viewing and his home going service. Also a testimony in of itself. Jesus is returning soon and there will be no more pain or parting. God bless your family. There’s A Hello After Goodbye a beautiful song. In Christ’s Great Love and Mine. Of course I remember you and Miss Fann. 🙂 Thank you so much for your kind words, for your friendship to my family, and for your encouragement. I hope that you are well! As you said, it seems like only recently in some ways, yet ages ago in others. I remember where I was when I got the phone call that your dad was suddenly taken to see his Savior. Your dad was a great man, and you have become a reflection of his integrity, love for others, love of family, and love for your God. We still truly miss you at HP and pray the best for you as you pastor your own flock. Love you and your family! Thank you, Mrs. Jensen, for your encouragement, as well as for your (and Mr. Jensen’s) investment in me and my family personally. I count it a privilege to have learned from you both. Thank you for your love, your prayers, and your continued friendship! It means more than I can say. I met your dad only once that I can remember, but that one time I was so struck by his kindness and his ability to make me feel like an old family friend. I prayed for you and your family often after hearing about his passing. Thanks for sharing your memories about him. Beth! Great to hear from you. Thank you for your kind words and for your prayers. I hope you and your family are well. Josh, I havent gotten to know you like some of your siblings, but I prayed for you guys a lot today. Having lost my dad as well, 10 years seems like forever at times and a moment at others. I’m at 16 years now, and it’s the same feelings. Thanks for posting this. It put to words many of my feelings, and made me appreciate your dad (and mine) even more. stay strong in the Lord, my brother! I’m praying for you regularly! Thank you so much for taking the time to read this and to share your encouragement and prayers, Michael. I’m sorry to hear of the passing of your dad too; I pray that God encourages and blesses you! Joshua, After reading your tribute to your father I feel like I missed something valuable and important in life not having the blessing of knowing him. Well, Josh I thought I was doing pretty well reading your beautiful tribute to Grandma Jeanne when we got to the awesome crowd at the funeral viewing. Mom said “is that all?” Silence from me wiping away the tears. Told her we would have to finish it another night:) You were certainly blessed with one fantastic man for a father and the memories of those years together are a true treasure. We miss you all!! Thanks so much for taking the time to read this and to share your encouragement, Mrs. Penix. We miss you, Dr. Penix, and sweet Grandma Jeanne! Stumbled across this, Josh. I remember praying earnestly for you and your family. This was one of the most encouraging and edifying things I’ve read in a long time—a model I hope to live up to as a dad. Thanks, Mark, for praying for us and for taking the time to read this and share some encouragement. I’m thankful for my dad and am also thankful for friends/peers who strive to be faithful dads today. Great to hear from you. I was blessed to enjoy a few meals with you and your dad. He and you both taught me a lot about loving God and others.